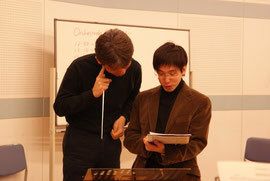 This conducting program is led by Shoichi Sean Kubota, the music director of the Orchestrada. As a conducting workshop applicant at the Orchestrada, you will work closely with Mr. Kubota and key guest conductors of the orchestra. Applicants will learn ear training and score-reading at each applicant's level which is fundamental of the art of conducting. Over the course, applicants will also have opportunity to understand what it is they want to convey when they stand in front of an orchestra and how to communicate it. Advanced applicants also have the opportunity to conduct reading sessions, rehearsals, and performances of the Orchestrada at the discretion of the music director.